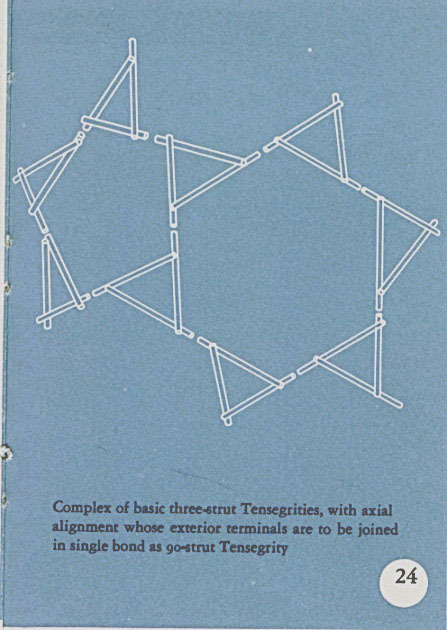 Read here the first major publication on tensegrity by Richard Buckminster Fuller. 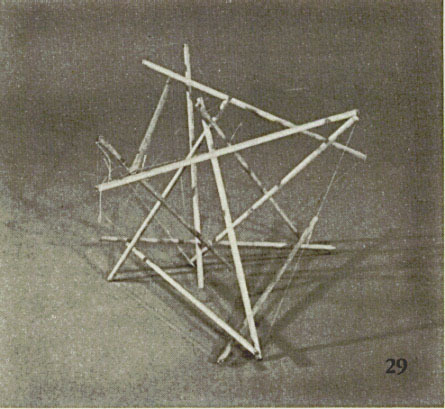 Richard Buckminster Fuller composed an essay entitled "Tensegrity" in December 1958, when he had worked out a system of structural solutions in the decade since Kenneth Snelson first showed him the X-piece. His patent application was submitted a year later, on 31 August 1959. 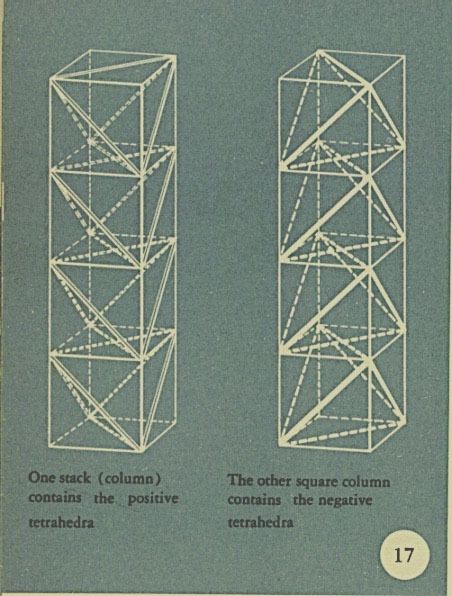 Version one is the published text as it appeared in Portfolio and Art News Annual, No.4, 1961, pp. 114-148. 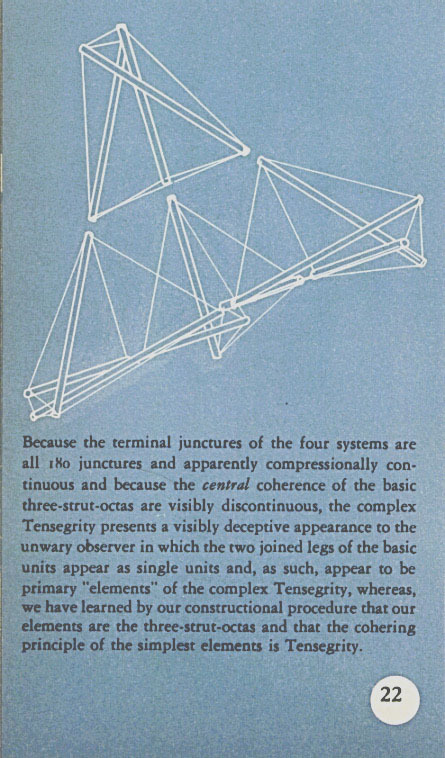 It was titled "Tensegrity, with an Introduction by John McHale." 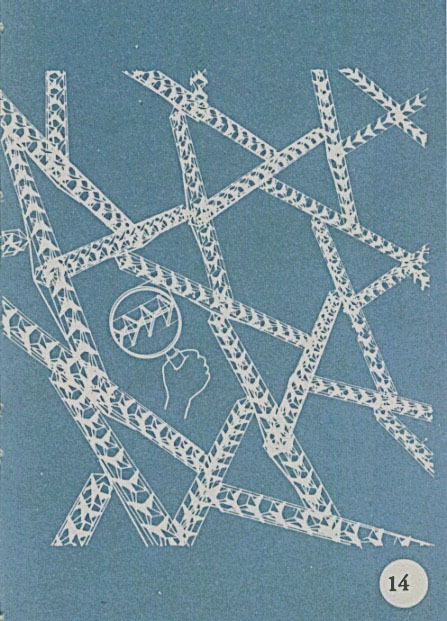 Version two is excerpts from Fuller's "Discourse on Structural Exploration and Invention," a 15 page manuscript written December 22, 1958. We present excerpts from Your Private Sky Discourses", pp. 226-241, which credits their source as "BFA, DI Sect. 36, n. P 110." 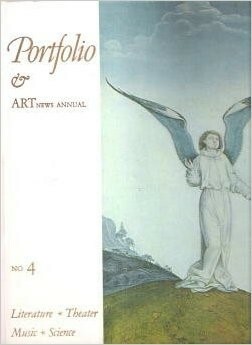 Cover of Portfolio and Art News Annual, No.4, 1961. The Inventor. (C) 1960 Allegra Fuller Snyder. Courtesy, Buckminster Fuller Institute, Santa Barbara. "link=[http://bfi.org"
Three structures, Museum of Modern Art. (C) 1960 Allegra Fuller Snyder. Courtesy, Buckminster Fuller Institute, Santa Barbara. 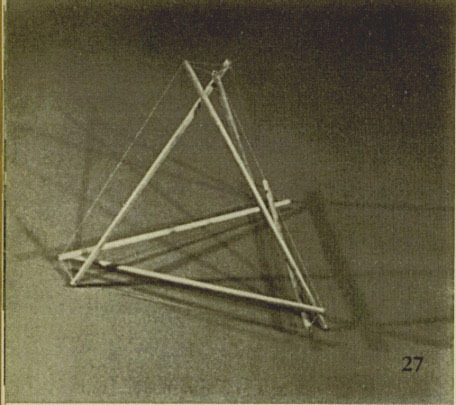 "link=[http://bfi.org"
Three of Richard Buskminster Fuller’s basic structures: Tensegrity mast, Geodesic dome, octet truss in the Fuller exhibition, Modern Museum, N.Y. 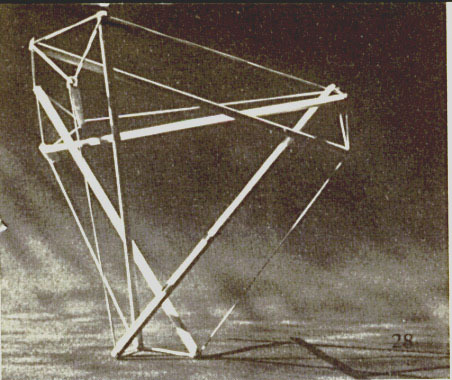 Whereas, engineers told me, before my full-scale demonstrations of Geodesic structures, that Geodesics would not work; now, after one-third of a century of expositional engagements and discourse, there has been produced altogether such an effect upon the general climate of technology that Geodesic componentation is frequently employed by others with satisfactory structural results, though the individuals do not know why. This occurs because of a subconsciously-marshaled approach of the design factors generated by hundreds of news photographs of successfully standing structures, ranging from desk models [Figs. 1 and 2]] to the largest clear-span enclosures of all history. Many of these are shown being flown to installation sites, some of which are at the world's formidable polar,mountain and desert regions. 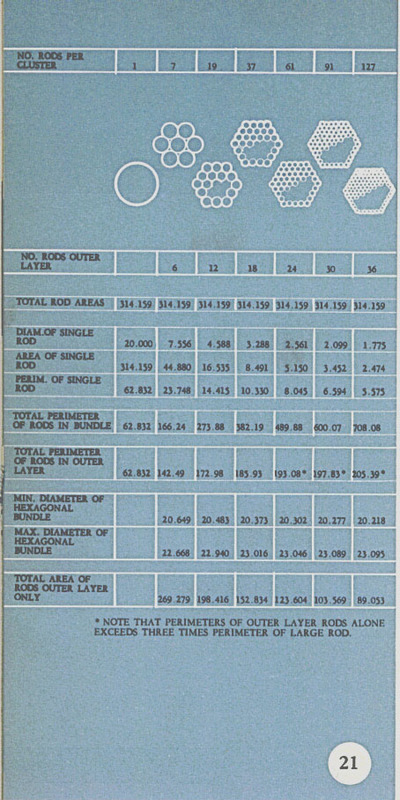 Figure 01. (C) 1961 Allegra Fuller Snyder. 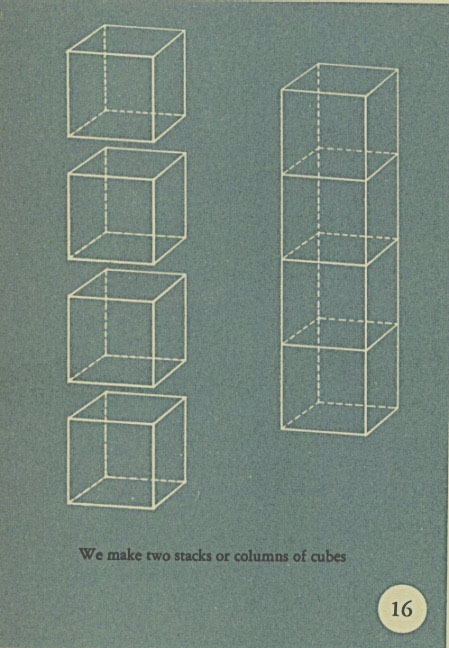 Courtesy, Buckminster Fuller Institute, Santa Barbara. Figure 02. (C) 1961 Allegra Fuller Snyder. Courtesy, Buckminster Fuller Institute, Santa Barbara. "link=[http://bfi.org"
Figure 10. (C) 1961 Allegra Fuller Snyder. Courtesy, Buckminster Fuller Institute, Santa Barbara. 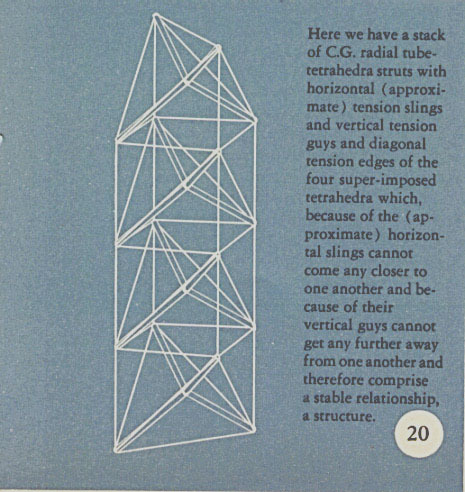 "link=[http://bfi.org"
What interested me back in 1927, regarding the limitless ratios of tensional slenderness,was whether we were trending toward bridges which had infinite length and no section dimension at all, or whether this was a nonsensical question. As a sailor I looked spontaneously into the sky for indicated clues. I found myself saying, "It is very interesting to observe that the solar system, which is the most reliable structure that we know of, is so constituted that the earth does not roll around on Mars as would ball bearings [Fig.3], which is to say that the compressional components of celestial structures are astro-islands spatially remote from one another and they are each shaped in the most ideal conformation for highest compressional-structure effectiveness which is the approximately spherical shape. In the spherical condition any aspect of a compressional system is its neutral axis, that is the sphere has an infinity of axes. 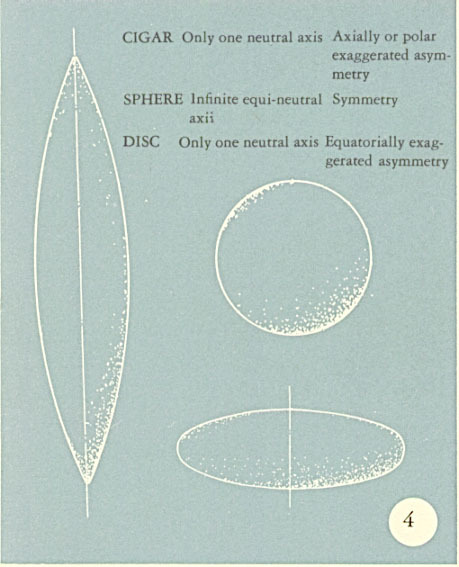 All other spheroidal (cigar, turnip, egg, potato or spider) shapes (Fig. 4) have only one most neutral axis. 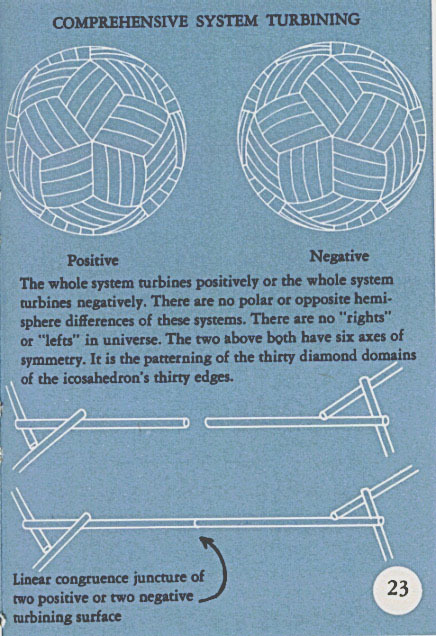 This is why spherical ball bearings are the most ideal compressional system structures of man's devising, as they continuously shift their loads while distributing the energetic effects to the most parts in equal, ergo relatively miniscule shares in the shortest time. Figure 03. (C) 1961 Allegra Fuller Snyder. Courtesy, Buckminster Fuller Institute, Santa Barbara. "link=[http://bfi.org"
Figure 04. (C) 1961 Allegra Fuller Snyder. Courtesy, Buckminster Fuller Institute, Santa Barbara. "link=[http://bfi.org"
Figure 05. (C) 1961 Allegra Fuller Snyder. Courtesy, Buckminster Fuller Institute, Santa Barbara. "link=[http://bfi.org"
Figure 06. (C) 1961 Allegra Fuller Snyder. Courtesy, Buckminster Fuller Institute, Santa Barbara. "link=[http://bfi.org"
Figure 07. (C) 1961 Allegra Fuller Snyder. Courtesy, Buckminster Fuller Institute, Santa Barbara. 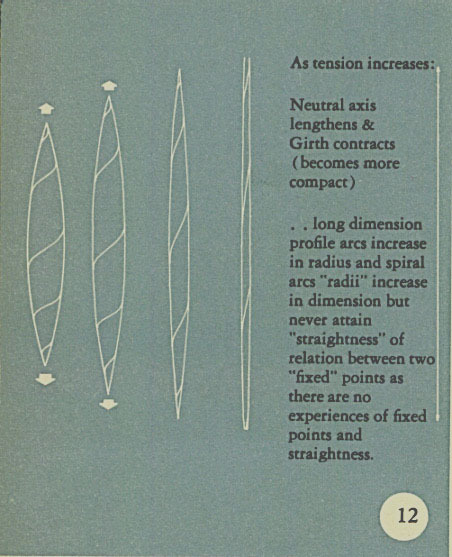 "link=[http://bfi.org"
Employing that concept as an hypothetical verity or working premise for further probing, I observed that whereas there existed a limit to slenderness ratio (as already noted) of a compression member's girth diameter in respect to its longitudinal axis length, no such limit slenderness ratio characterized tensional dominated structural components. Astronomical magnitudes of structural system coherence are accomplished by tensionally dominated structural functions of zero slenderness ratio, i.e. by gravitational functioning. 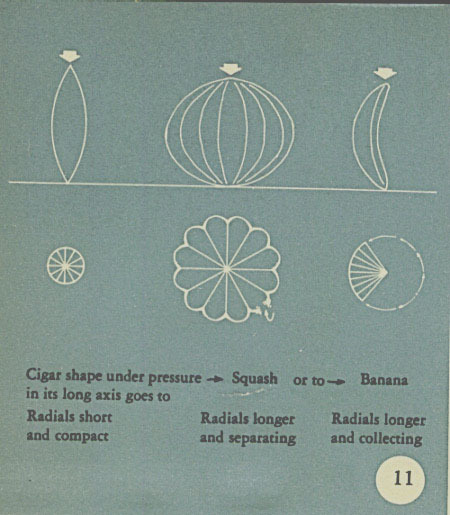 I also noted that compressionally dominated structural components tend toward contour transformation in which the radius of curvature steadily decreases under axial loading, that is the cigar shaped column forces tend toward "squash-" or "banana"-like bending of their contours [Fig. 11]. This tending of compressionally loaded systems toward arcs of lessening radius was in direct contrast to the contour transformation trending of tensionally dominated structural components which always tend toward arcs of ever increasing radius of axial profile. 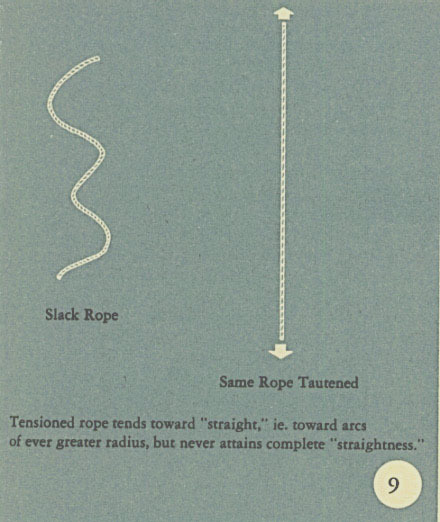 For instance, the coil of rope tends toward "straightening out" when terminally tensed, but never attains absolute straightness[Fig. 9]; instead, it progresses toward ever-greater radius of locally-spiralling but overall-orbital arcing which must eventually cycle back upon itself [Fig. 12]. Tensionally dominated patterning is inevitable self-closing, ergo finite. Figure 11. (C) 1961 Allegra Fuller Snyder. Courtesy, Buckminster Fuller Institute, Santa Barbara. Figure 09. (C) 1961 Allegra Fuller Snyder. 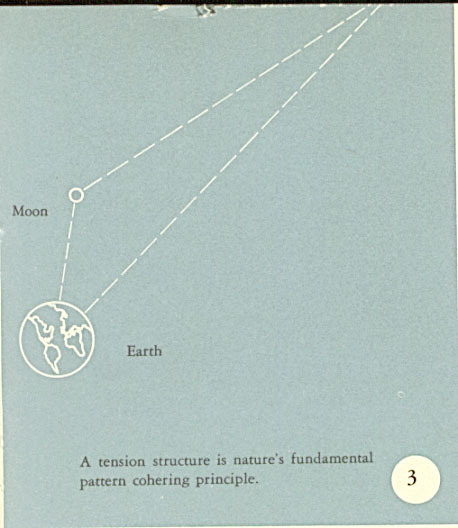 Courtesy, Buckminster Fuller Institute, Santa Barbara. Figure 12. (C) 1961 Allegra Fuller Snyder. Courtesy, Buckminster Fuller Institute, Santa Barbara. Figure 13. (C) 1961 Allegra Fuller Snyder. Courtesy, Buckminster Fuller Institute, Santa Barbara. "link=[http://bfi.org"
Figure 14. (C) 1961 Allegra Fuller Snyder. Courtesy, Buckminster Fuller Institute, Santa Barbara. "link=[http://bfi.org"
Figure 15. (C) 1961 Allegra Fuller Snyder. Courtesy, Buckminster Fuller Institute, Santa Barbara. "link=[http://bfi.org"
Figure 16. (C) 1961 Allegra Fuller Snyder. Courtesy, Buckminster Fuller Institute, Santa Barbara. "link=[http://bfi.org"
Figure 17. (C) 1961 Allegra Fuller Snyder. Courtesy, Buckminster Fuller Institute, Santa Barbara. "link=[http://bfi.org"
Figure 18. (C) 1961 Allegra Fuller Snyder. Courtesy, Buckminster Fuller Institute, Santa Barbara. "link=[http://bfi.org"
Figure 19. (C) 1961 Allegra Fuller Snyder. Courtesy, Buckminster Fuller Institute, Santa Barbara. "link=[http://bfi.org"
Figure 20. (C) 1961 Allegra Fuller Snyder. Courtesy, Buckminster Fuller Institute, Santa Barbara. "link=[http://bfi.org"
1. 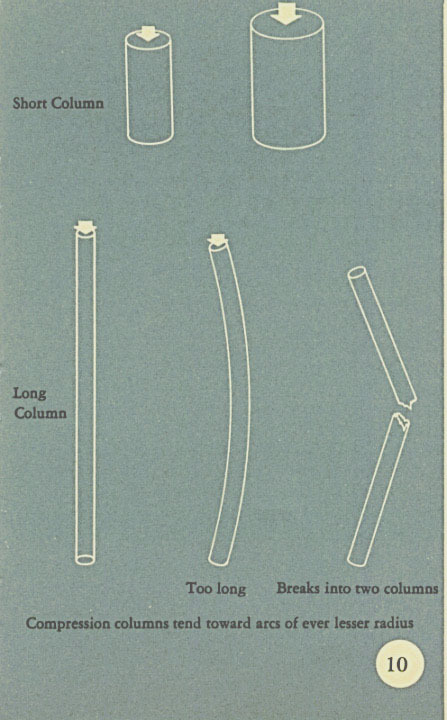 We know that the progressive sub-division of a given metal fibre, into a plurality of fibres, provides tensile capabilities of the smaller fibres at increased magnitudes up to hundreds and thousands-fold that of the unit section. This is because of the increased surface-to-mass ratios and because all tensile capability is apparently invested in the surfaces [Fig. 21]. 2. 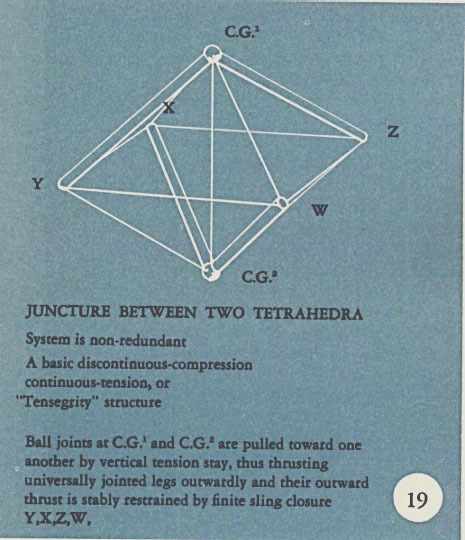 The Geodesic Tensegrity spheres are capable of mathematical treatment in such a manner as to multiply the frequency of triangular modular subdivision in an orderly 2nd power progression and formulatic control. Figure 21. (C) 1961 Allegra Fuller Snyder. Courtesy, Buckminster Fuller Institute, Santa Barbara. "link=[http://bfi.org"
Figure 22. (C) 1961 Allegra Fuller Snyder. 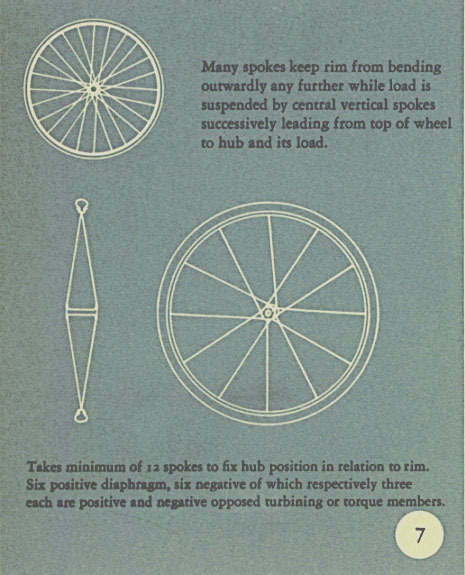 Courtesy, Buckminster Fuller Institute, Santa Barbara. "link=[http://bfi.org"
Figure 23. (C) 1961 Allegra Fuller Snyder. 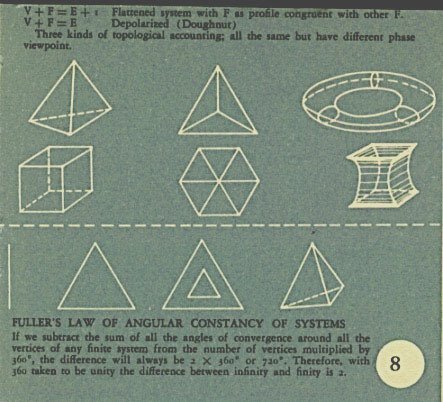 Courtesy, Buckminster Fuller Institute, Santa Barbara. "link=[http://bfi.org"
Figure 24. (C) 1961 Allegra Fuller Snyder. 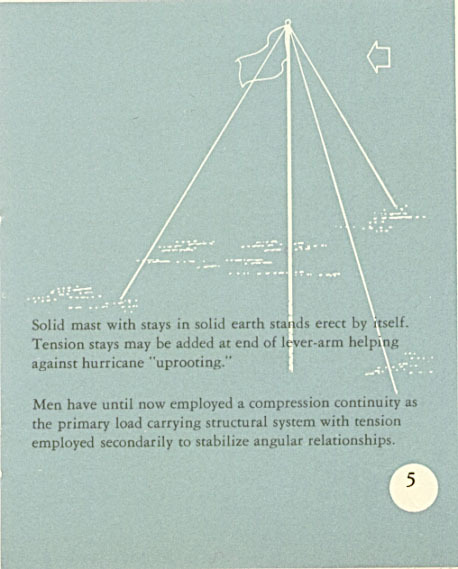 Courtesy, Buckminster Fuller Institute, Santa Barbara. 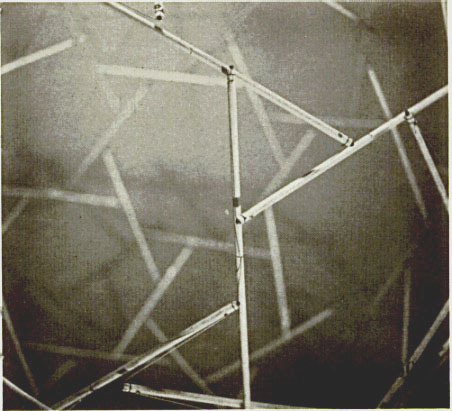 "link=[http://bfi.org"
There are Tensegrity Geodesic structures suitable for moon or independent satellite use (or any seed-pod flight compactness and remote installation with automated opening), whose enclosing, complex skin-mesh trussing and structural-mesh trussing have fixed-size dimensionsÑas referred to a common linear standard, e.g. the international meter. 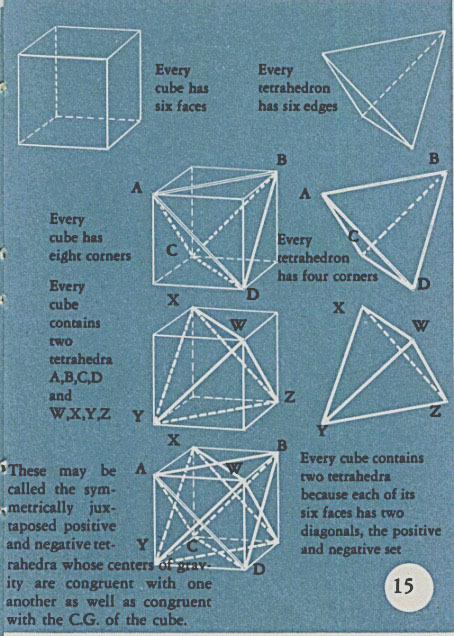 They have a constant ratio of the number of such fixed dimension components per given unit area of local surface of the structure, regardless of the overall sphere's size. This local constancy of pattern sizing and distribution ratioing is accomplished by modular frequency multiplications in respect to a discretely dimensioned hierarchy of progressively larger spheres. 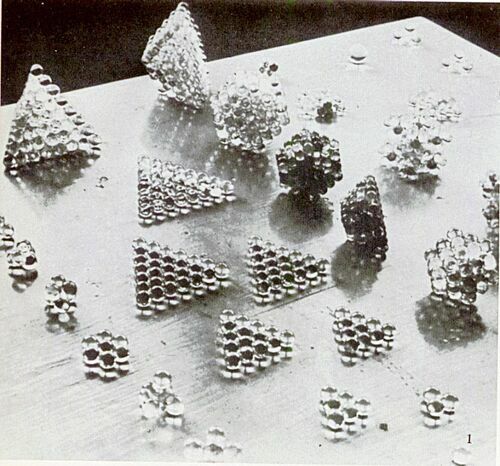 In such Tensegrity spheres the weight per superficial unitary area ( square foot, for instance) approaches approximate constancy as the large spheres grow larger, wherefore the cubic feet of volumetric enclosure accomplished per unit weight (pounds) of enclosing structure multiplies rapidly with the increasing overall sphere sizing. Of course, the pounds of air enclosed per pounds of structure also rapidly increase (as is also true in respect to non-rigid balloons). 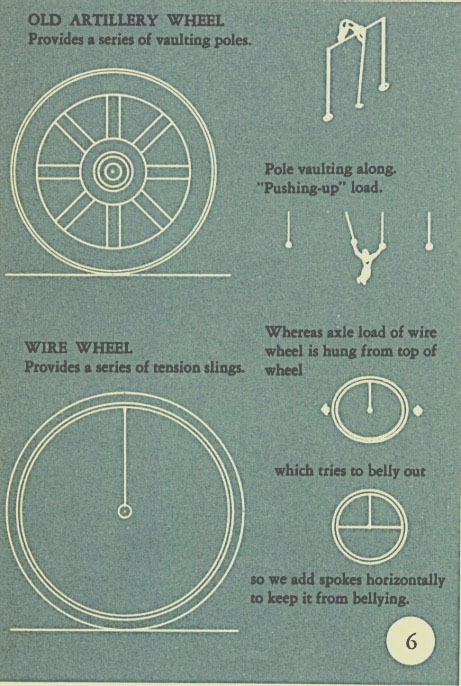 For instance, at sea level, one pound of structure, of a Tensegrity sphere of a diameter of one hundred feet, suitable to all the functions herewith considered, encloses two and one-quarter pounds of air. A one-hundred footer encloses twenty tons of air, with nine tons of structure, for a total displacement of twentynine tons. 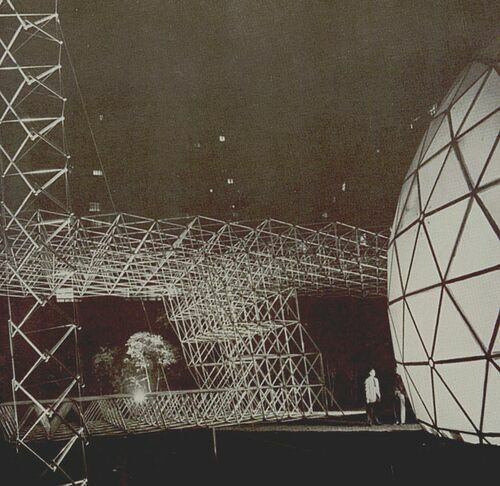 Each pound, of a six thousand foot diameter Tensegrity sphere, encloses one hundred and sixty-eight pounds of air, i.e. a one and one-eighth mile diameter Tensegrity Geodesic sphere (with an internal equatorial circular area of one square mile and an external structural surface of four square miles and girth of three and one-half miles) encloses nearly five million tons of air--with only fifty-six thousand tons of structure (S.S. Queen Mary: 81,237 tons). The one-and-one-eighth-miler, weighs only one percent of its air cargo. 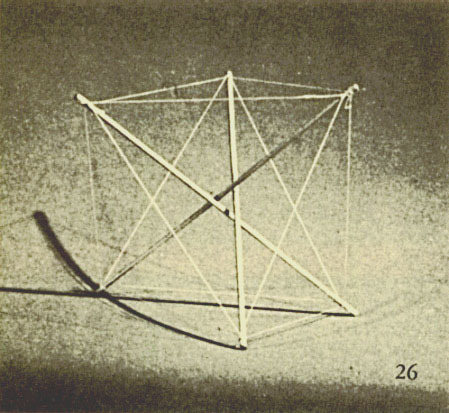 Therefore only a minor reduction of interior air pressure (in the latter case under 5%), inconsequential to its structural capability, would so reduce gross atmospheric displacement of the one and one-eighth mile Tensegrity as to cause it to float outward from earth--to various altitudes within the earth's atmospheric envelope, proportional to the interior percentage reduction of air content. If partially emptied of air and refilled with helium, it could float at considerable altitudes and remain unsinkable except over long periods of slow leakage, even though shot full of holes, as the interior gases would not be under pressure, ergo tending to escape (as they would in a, gravitationally-accelerated collapsing, flexible-skinned balloon of the well known pre-Tensegrity type). 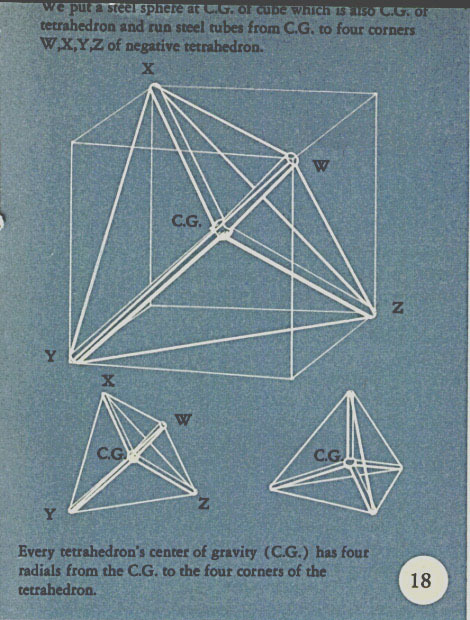 Sequence of figures below: A Progression in Tensegrity structures from simple to highly complex is seen on these two pages, culminating in the sphere (Fig. 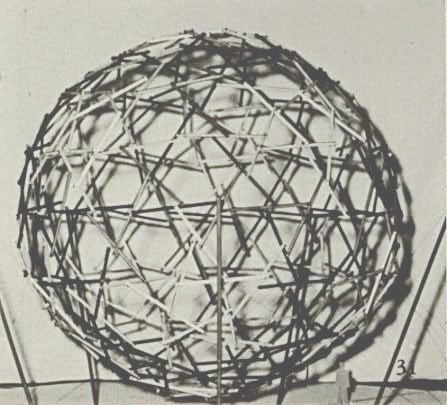 31), model for a forty-foot, 270-strut sphere which was built at the University of Minnesota in 1953-54. 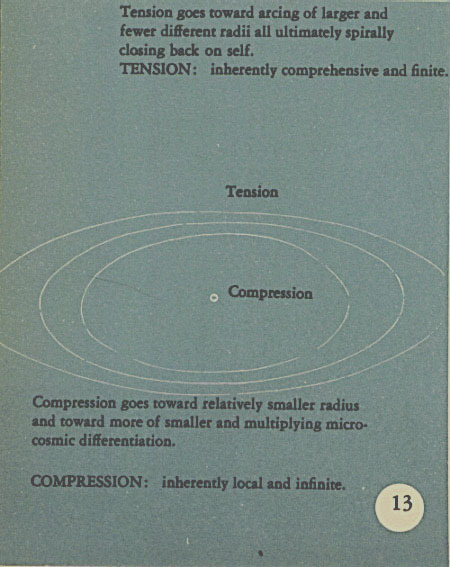 Note that compression members do not touch (they are not continuous), but the only continuous, cohering force is tension. 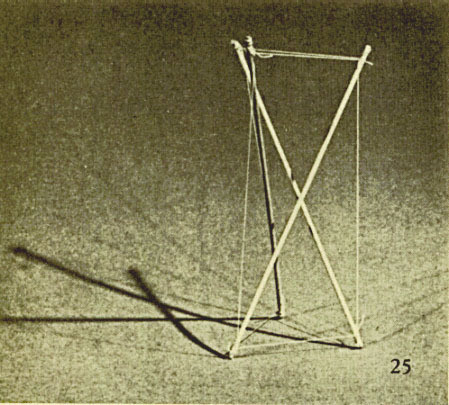 Figure 25. (C) 1961 Allegra Fuller Snyder. Courtesy, Buckminster Fuller Institute, Santa Barbara. "link=[http://bfi.org"
Figure 26. (C) 1961 Allegra Fuller Snyder. Courtesy, Buckminster Fuller Institute, Santa Barbara. "link=[http://bfi.org"
Figure 27. (C) 1961 Allegra Fuller Snyder. Courtesy, Buckminster Fuller Institute, Santa Barbara. "link=[http://bfi.org"
Figure 28. (C) 1961 Allegra Fuller Snyder. Courtesy, Buckminster Fuller Institute, Santa Barbara. "link=[http://bfi.org"
Figure 29. (C) 1961 Allegra Fuller Snyder. Courtesy, Buckminster Fuller Institute, Santa Barbara. "link=[http://bfi.org"
Figure 30. (C) 1961 Allegra Fuller Snyder. Courtesy, Buckminster Fuller Institute, Santa Barbara. "link=[http://bfi.org"
Figure 31. (C) 1961 Allegra Fuller Snyder. Courtesy, Buckminster Fuller Institute, Santa Barbara. "link=[http://bfi.org"
Figure 32. (C) 1961 Allegra Fuller Snyder. 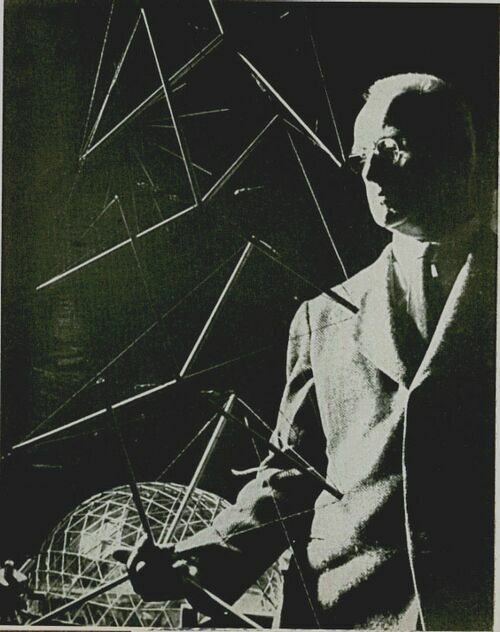 Courtesy, Buckminster Fuller Institute, Santa Barbara. "link=[http://bfi.org"
CAPTION to Fig. 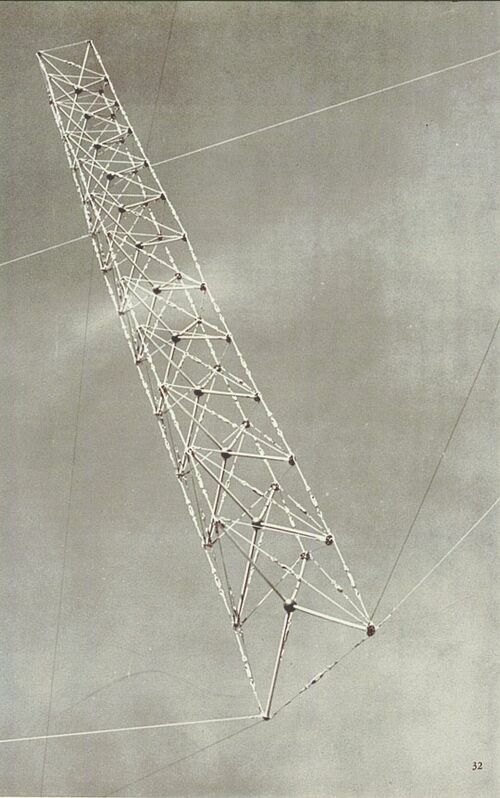 32: This four-sided Tensegrity mast, one of the family of masts which has grown out of Fuller's discoveries, consists of discontinuous compression islands--each composed of tetrahedronal strut groups which are mounted, exclusively in tension, one above the other. It was constructed under Fuller's direction by his students at the University of North Carolina ca. 1950, and is about 20 ft. tall. See Your Private Sky, Discourses. This page was last edited on 25 December 2018, at 20:31.